Tonight at the Mod Club in Toronto, Mark Lanegan and Greg Dulli will darken the stage under the banner of The Gutter Twins. 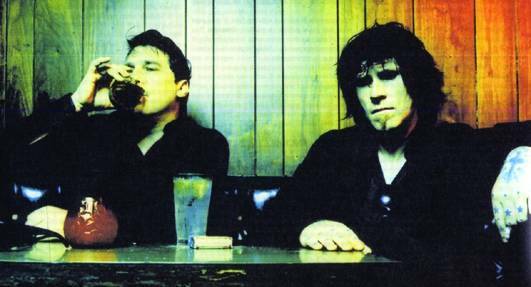 Lanegan was once the singer for the Screaming Trees, and more recently has done work with Queens of The Stone Age. Dulli was once the front man for the Afghan Whigs, and sang for the Backbeat. A super group effort that included Thurston Moore, and Dave Grohl. Dulli and Lanegan have been slowly inching towards this point since rumours first surfaced during interviews back in 2003. The studio album, Saturnalia, was just released by Sub Pop. The music is dark, brooding, and soulful. I’d venture to say gothic but that might imply a negative connotation to some. I’d suggest going to their MySpace page and check out some tracks, such as All Misery/Flowers, and Idle Hands, or you can listen to the entire album through streaming here. A live video from a show at the Bowery Ballroom in NYC is below. The song played is Papillion.